Description: 10th Street Park Washington DC. 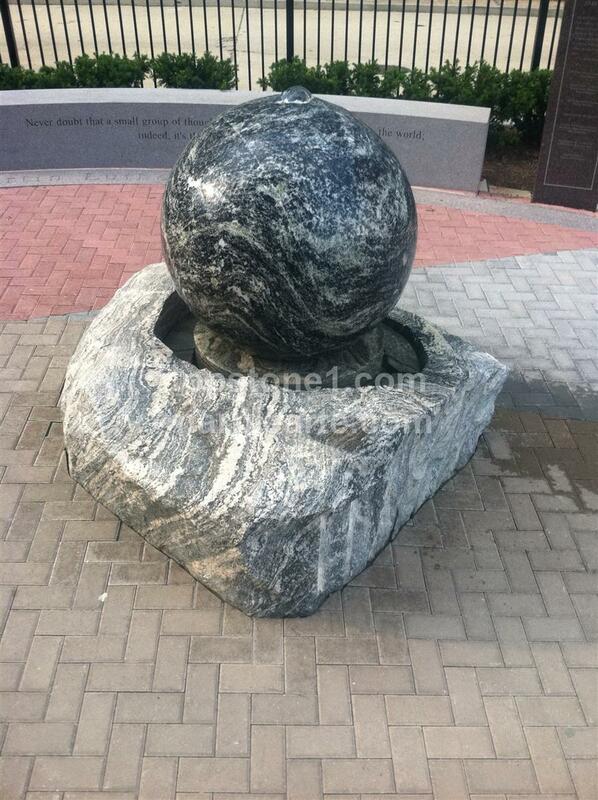 This Water Feature Sphere outdoor fountain is 36 inches in diameter and sits on a Natural Rock base. In a world teeming with new technological advancements the humble garden fountains seem age-old. But that is a miss-conceived notion, as people today opt for fountains like the sphere water fountain and the Ball water fountain to pave the entry into the most luxurious of accommodations. Granite fountains are the more seasoned options that have every gardener wishing for a tiny piece of paradise’s flowing stream tucked into their piece of earth. The unlikely batch of marble spheres , floating spheres act as anti- depressants to people to see the rotating on a rock base that serve to remind people of the intricacies availed even using water. Granite balls adorn the otherwise mediocre setting on street corners or even inlaid in the watery depths of a garden fountain pump. They can be tiny or even as big as a boulder, yet all the while revealing a gentle strength in its ability to stay on balance and smooth or heighten the water’s immensity. The Garden fountain pumps are an added architectural advancement to relishing a way to offer drinking as well as a simple setting for watery springs. Fountains in gardens are still the best option that makes many people ready to tread through the weeds and set their sights on the languid stream of aqua that symbolizes more than just a quenching juice, but an aphrodisiac for the mind.